A couple of years ago, I had great luck making a cherry buttermilk sherbet. The only ice cream maker I had at the time was a large and clunky (but beautiful) turquoise vintage hand-crank one. I didn’t pull it out of our storeroom and instead just froze it and whisked it a bit and as luck would have it, it was a tasty success. But now I’ve got an electric ice cream maker and it’s so easy to try out crazy flavour combinations on a whim. So far I’ve had great luck with Mexican chocolate ice cream, coconut cherry chocolate frozen yogurt and bourbon buttermilk ice cream. So when the BC Blueberry Council came a-knocking at my door with containers of fresh, local BC blueberries I figured I’d try my hand at another wacky but elegant flavour combination. Thanks BC Blueberries! The previous evening we had cracked open a bottle of riesling and we had a bit left in the bottle so I figured I’d add it to the mix. The rosemary came about because the rosemary growing on our balcony was looking full and lush so I plucked off a stem and got to work. I whipped up a quick sugar syrup and added in the rosemary to infuse for a couple of hours. This recipe doesn’t use up all the rosemary syrup, so go ahead and use it in a cocktail – I think this would be perfect in a Pimm’s Cup or blackberry smash (here’s a recipe for something similar). 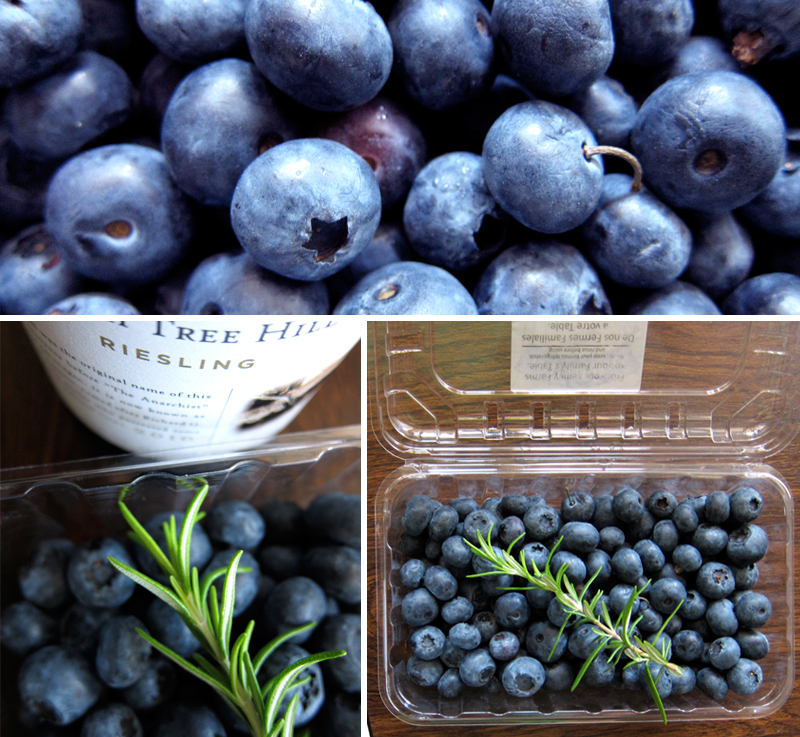 The fresh blueberries get blended along with the rosemary syrup and the white wine. I chose to strain out the blueberry skins for a smoother texture, but that’s up to you, but I like the strained version much better. The mixture then heads to the fridge for a bit of a chill before churning. I liked this best right out of the machine – it’s soft and smooth and it gets a little sloppy in the best way. But you might want to give it an hour or two in the freezer to firm up a bit. So how did it taste? Pretty wonderful and quite elegant. The rosemary is subtle but definitely there – if you want a stronger flavour, let the sugar syrup infuse longer. The riesling is quite nice with the blueberries and I’m sure a chardonnay would be lovely too. Just use a nice wine, one you’d use for drinking. If you don’t have an ice cream maker, don’t fret! This makes perfectly elegant popsicles for the grown-up set (just skip the cool-down stage). And you can make sorbet by freezing the mixture in a metal tray and giving it a whisk every now and then until it gets to the texture you like best. elsewhere: Check out this summery Sweet Pepper & Cauliflower salad recipe over at Poppytalk. The recipe is adapted from David Tanis so you know it’s delicious. In a small saucepan, heat water and sugar until sugar melts. Add rosemary and let the mixture cool. Refrigerate for at least 2 hours, though 4 might be just right. Remove rosemary. 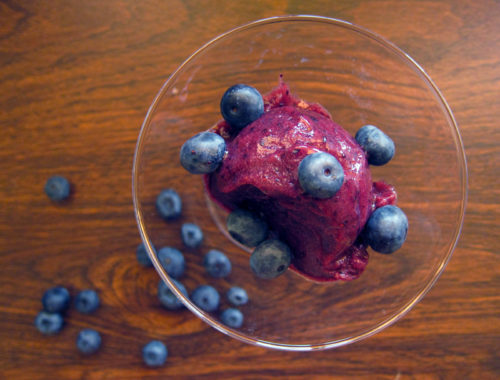 Add the blueberries, riesling and black pepper to a blender and give it a whirl. Pour in 1/3 cup of the rosemary sugar syrup and blend again until well mixed. Strain mixture into a bowl using a fine mesh strainer and let the mixture cool, covered, in the fridge for about an hour, where it will become strangely gelatinous. If you are making popsicles, skip the cooling part and just pour into your popsicle maker & freeze overnight. 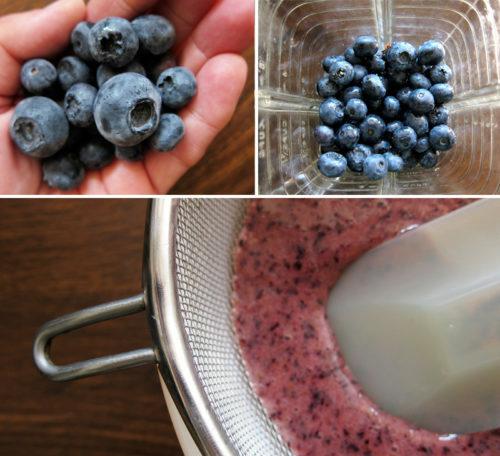 Pour blueberry mixture into your ice cream maker and churn according to manufacturer’s instructions. 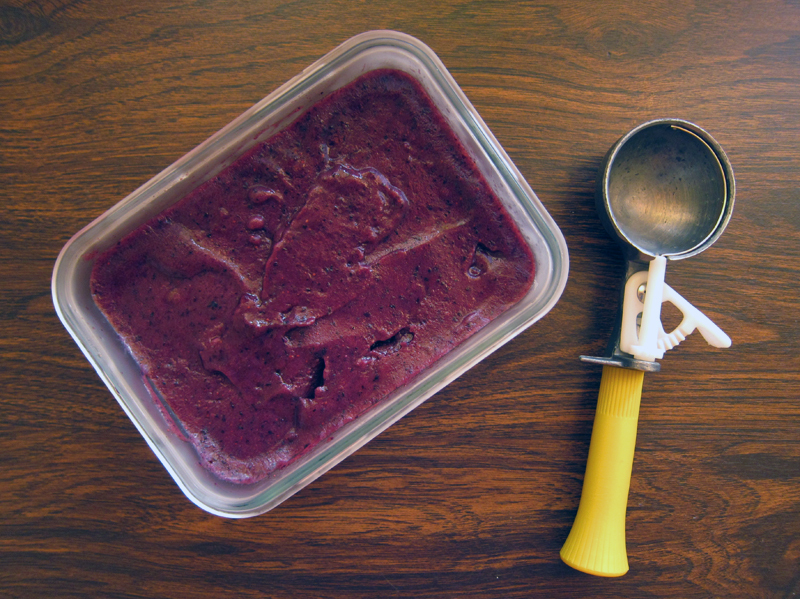 Eat immediately if you like a soft sorbet or freeze for 2 hours before eating. this looks SOOOOO good. I’d love to put a scoop in a mug of gin! Since then I’m rather cooking my blueberries, they get a lot more beautiful color, because the color is mostly in the skin and gets released better by heat – and it doesn’t turn brown. Thanks Tracy! Yes, this would be over the top indulgently awesome with gin! Nutso!! Hi Robert, no, my puree stayed purple through and through – from the pureering & cooling stage to frozen. No brown issues whatsoever. Wow that looks delicious! I’m going to use this to convince my boyfriend that we need an ice cream maker! omgggggg Jeannette! This. is. IT. I’ve become quite enamored with the idea of mixing herbs into ice cream and adding a fruity flavor to go along with it makes it all the more fabulous! Great use of the blueberries! Next you should try lemon-lime-lavender sorbet — uses the same principle, with lavender buds added to the simple syrup and strained out. so, so refreshing and delicious. Yum, yum and yum! Beautiful, and what a fabulous flavor combo!!! Lucy, if you don’t get the ice cream maker, don’t get discouraged – you can easily make it without one! Joanne, it’s a surprisingly good combo! Mmm, sounds delicious Snarkapuss – I love a good lemon-lavender drink, so I’m sure I’d love it in sorbet form too. Joy, I really wanted to try my hand with adding grapefruit juice, but I think this makes up for it! Hooray for bc blueberries! Thank you for the recipe… It means that summer isn’t gone yet when there are still so love sorbet recipes! This looks luscious! I love the vibrant colour and the rosemary addition. I have to admit, I haven’t used my ice cream maker once this summer. I guess it’s still not too late. p.s. What would you call this ice cream if you were to give it an ice cream parlour name? Blueberry Hill? Rosemary’s Bluebaby? LOL! Lulu, thanks! It was a successful experiment. Blanka, indeed – we must prolong summer as much as possible! The colour is so gorgeous, Bijoux and it’s never too late to make icy treats. Especially when fruit are in abundance. And Rosemary’s Bluebaby?? Too funny!! Robert, I have no idea since I’ve never pureed blueberries before this week & it worked out for me. Maybe it was the wine! I love how you elevated this blueberry sorbet with Riesling and rosemary! It sounds delicious.